As you know (probably), on the weekends I've been trying to use up some of my strings and crumbs because it felt like I had so many and I was never using any of them. So, instead of feeling a lot of guilt about it, I decided to try to work with them every weekend - at least a little bit if at all possible. This is what I did to my Crumby Star quilt that I'm working on featuring these pieces of leftover blues second hand fabrics from my upcycled blues project. 1. Made some more crumb blocks in effort to get my 18 - 9" blocks ready for making the half square triangles (HST) needed for the next big border. I readily admit that these pieces are less "crumby" than the pieces I've sewn on to the adding machine tape or used in the stars in the top already made. It is hard to make big enough pieces to cut out 9" squares by using tiny pieces. Not only does it take a long, long time, but it is really hard to do it. You end up having to make smaller blocks and sewing those together and I didn't want to do that for this. 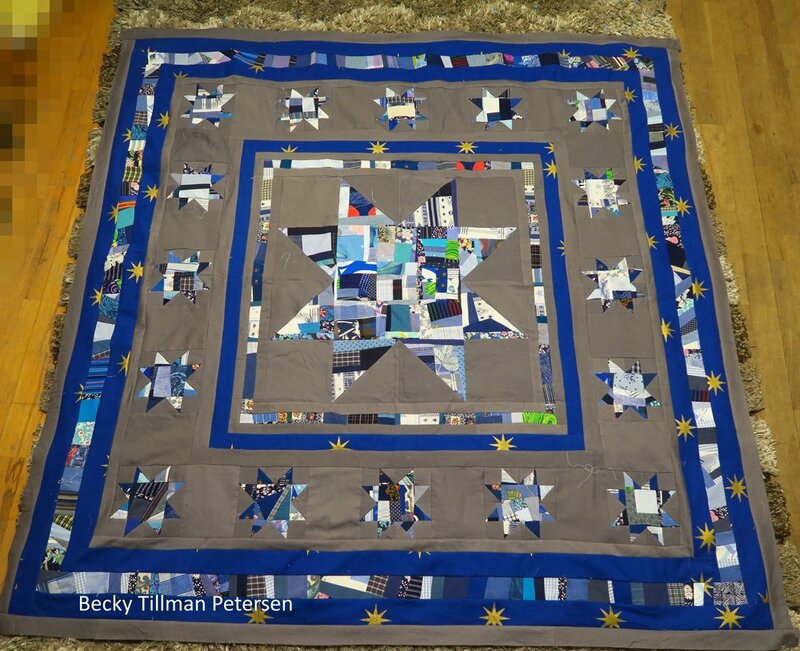 2 Added a skinny gray border, a royal blue (this fabric was a set of curtains in its former life) and a border of scraps stitched to adding machine tape and then another row of royal blue. Around all that I put a row of gray. The next planned border will be the rather large HST (see point 1). I will need to finish up the rest of those before I can continue with the top. It is 64.5"x64.5" so far. I need it that size so I can put the next round of 8" HST around it. In spite of the fact that I am using crumbs and such, I am always impressed by how much the final product looks like the plan. 3. Cut 11 9" squares from the "made fabric" that I had. These will be used in the HST in the next border. I still need to make 7 more. I will use up the leftover scraps from what I cut up to make these. 4. Added about 3-4 feet of blue scraps to the adding machine tape. Somehow I wasn't in the mood for it so I haven't even sewn it to the edges and trimmed it down. I'd like to finish sewing scraps to the rest of the tape and then figure out a way to use them. 5. Made 3 Woven star blocks. Alas! I see a mistake in the block to the right. I will probably not use it. But I made it. :) Maybe I can use it in an orphan block project. The original pattern is found here - a free paper pieced pattern from Andover fabrics. I have 16 finished ones so far. I will need over 200, so this is a long term project. And that's it. But I'm all right with this considering my heart and mind were on binding charity quilts. I put myself on hold starting Saturday about lunchtime, though, to let myself rejuvenate for hopefully finishing them up hopefully this week. Right now my smaller Janome 350E is working away making labels - one at a time. Each one stitches out in about 25 minutes. I'm going to really need them in the next couple of days in order to finish the last 30 or so tops. I usually add the label when I bind them unless they already have a label. The ones that already have a label on the front were made by a friend in AZ - I had given her a stash of labels I made up in the past. The problem with me is that I didn't have a nice stash of labels when I started this massive push to finish up these tops. I had some - but not enough, so I'm busy (ha ha - my machine is, that is) making labels - trying to keep up with my needs. And don't forget if you need something from my sister in the shop - she is happy to serve you!